In this tutorial I will guide you how to add Instagram profile to your Blogger sidebar. We have used exactly the same tactic for developing this widget that we used in our previous tutorial and I'm sure you would surely love it once you add it into your Blogger blogs. 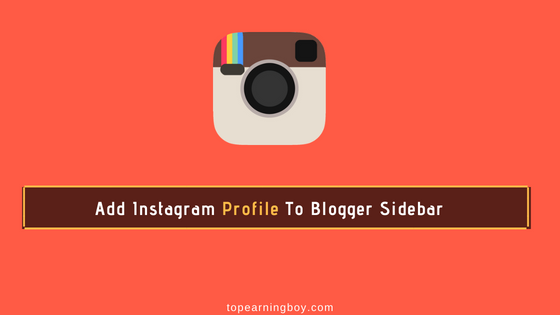 What is Blogger Instagram Profile Widget? An Instagram profile widget displays your Instagram profile along with your Instagram username, total photos or videos that you have uploaded , number of followers that you have and number of people that you follow! It also displays your profile photo with the complete bio and when someone clicks on your profile photo then he gets a cool ride straight to your Instagram account. Sounds amazing ? Now let's see its features before we add it to our Blogger sidebar. As Instagram API doesn't allow to access any data without access token therefore you need to first get your access token. Since we have discussed how to generate your access token in the previous tutorial so we are not going to discuss it again. This tutorial helps you add your Instagram profile to Blogger blog without using any third party service so you should give this fast loading widget a chance! If you still have any query regarding this tutorial then comment in the section below. Peace!